Prior to the Apollo missions to the moon, scientists speculated that volatiles - including water - may have accumulated in permanently shaded regions at the poles. Then the Apollo era brought the return of lunar samples, enabling real measurements: They found none of the water-bearing minerals common on Earth. Over the past ten years, however, several developments have reinvigorated the discussion. In particular, new analyses of volcanic glasses in the sample returns have inferred the presence of water in the moon's interior. Meanwhile, several new lunar missions have been launched. The ones using neutron spectroscopy to search for water have come up with mixed conclusions, but those using infrared spectroscopy seemed to reach unambiguous identification of water on the lunar surface, although in disagreement with the neutron experiments. CfA astronomers Anthony Case and Justin Kasper were members of a team of astronomers who propose a new method to detect hydrated material on the moon - like water - by measuring the strength of protons coming from the lunar surface with the CRaTer instrument (Cosmic Ray Telescope for the Effects of Radiation) on the Lunar Reconnaissance Orbiter, a NASA robotic orbiter launched in 2009. Cosmic rays from the galaxy, when striking the lunar surface, will knock protons out of material on the surface which can be detected by the CRaTER instrument. 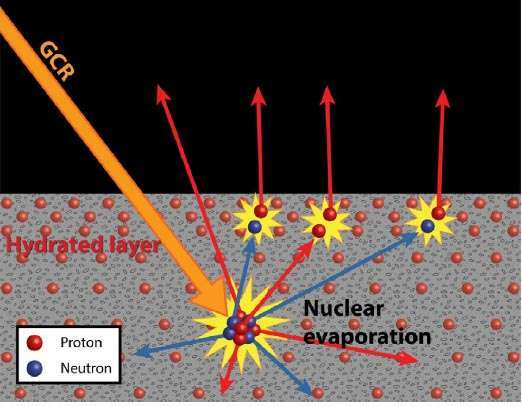 The team completed a set of laboratory tests using high energy particle accelerators to simulate the effects of cosmic rays on materials containing hydrogen, and found that the presence of hydrogen - in water for example – actually suppresses the overall proton emission. The implication is that if water is present near the poles of the moon, a scan across the lunar surface should show a clear reduction in numbers of protons as it crosses the poles.